If you’ve been researching the diving in Nusa Lembongan or Nusa Penida you’ve probably come across the term “drift diving”. This is something you will hear about often if you enquire about visiting Indonesia for dive trips. 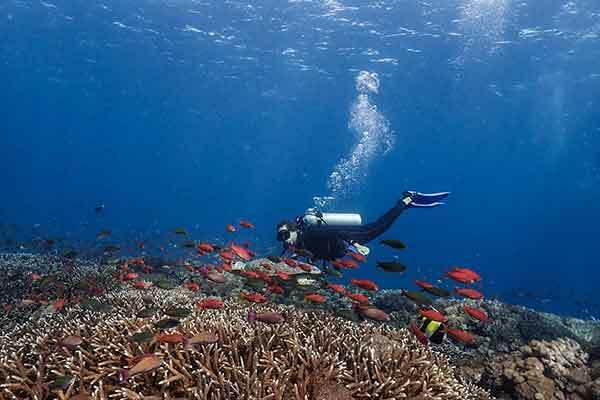 Indonesia is well know for its strong ocean currents and vast glorious reefs abundant with fish. It is these very currents that make diving Indonesian waters so incredible. The strong currents here bring much of the nutrients and plankton with them that our reefs rely on as a food source including that of our resident Manta rays. As the ocean currents push their way south through Indonesia, squeezing between the 17,000K plus islands and atolls, this creates upwellings and downwellings. These upwellings bring up nutrient rich water from the deep, a vital part of the marine ecosystem. It really is liquid magic! We wrote last year a blog about ‘The Indonesian Through Flow’ so check that out for some further information about what actually causes the currents HERE. Drift diving is a wonderful way to dive an area which is prone to current. Rather than starting your dive at one point and returning again, you let yourself drift where the current carries you. You can sometimes avoid having to kick against any current at all. We call this “lazy diving” as often minimal effort is required. You only need to fin kick to avoid obstacles and for steering. 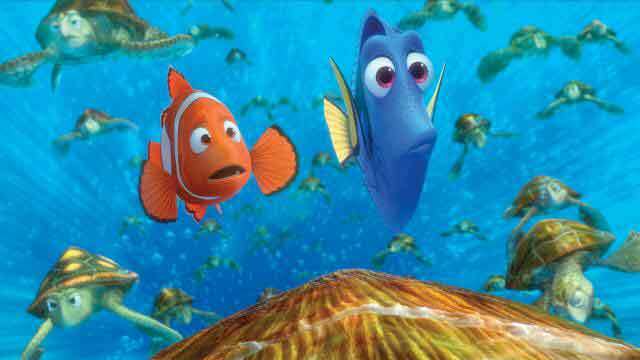 Remember the scene from ‘Finding Nemo’ where Marlin and Dory find themselves riding the ‘EAC’ (East Australian Current) which carries them great a distance? Essentially drift diving does exactly that! On the North coast of Nusa Penida and Lembongan we have some wonderful and thrilling drift dives. They can sometimes carry us further than 1km in a single dive. Depending on the tide change the drift can be slow and relaxing or fast and exhilarating. A little bit like when you step on the travelator at the airport. Drift diving has many advantages apart from requiring less energy and effort. It allows you to cover a much larger area of reef in a single dive. This will present you with more marine life than you may have seen otherwise. Not only that, but in areas of strong current generally you tend do get much more abundant marine life and chance for larger pelagic animals. We are very lucky as currents abound here on the Nusa islands. 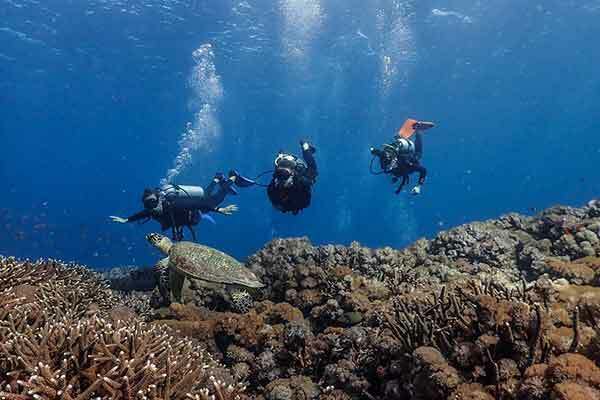 For example, the dive site ‘Blue Corner’ on the north side of Lembongan. Blue Corner is famous not only for its very strong current, but also the highest chance of encountering Mola than any other site around the islands. In 2017 divers reported seeing up to 17 Mola on a single dive, the holy grail of diving! Though not occurring often, during peak Mola season, drift diving on sites with stronger current may present you with higher chances for encounters such as these or even dolphins and sharks. As with upwellings, we can also sometimes encounter the opposite called ‘down current’, the words that strike fear into many divers. But learning how to handle and predict a down current can be altogether quite easy, as long as you follow the right procedures. First of all, when planning a drift dive there are special considerations to take into account before jumping in. These are things we always check before we go out for drift diving in Penida and Lembongan. Generally most dive sites where strong current is present are best dived around or on slack high tide. It depends on the dive site but many are also better dived at times when tidal changes are smallest. This way the current is generally more gentle as you have less water flow in and out during the change of tide. This information can be gathered by checking your local tidal charts or on an app such as ‘Magic Seaweed’. If you were for example to dive at the famous ‘Blue Corner’ at low tide near full moon on a big tidal change… this may be more like diving in a flushing toilet and down current can almost be guaranteed. But if dived close to high tide with a relatively small tidal change it will most likely be a nice relaxed drift. However, nature is not always so predictable so it’s best to know what to do should you get surprised by a down current. First of all when drift diving its always important to keep close to the reef. Close enough that you could easily swim and grab onto something at any moment. The current is usually much stronger in mid water away from the reef than it is close to the coral. Thus we always keep our divers close to the reef even when the current seems gentle. Keep your eyes ahead of you so you can see what the current is doing in the distance. Watch what direction your, and fellow diver, bubbles are drifting. Also look at the fish ahead, fish always swim into or against the current. So if the fish look like they are swimming up, it means there is down current present. If your bubbles suddenly start swirling around you or going down then yes, there is down current. If you’re hit by a down current, first thing is to get your body as close to the reef as possible and signal your buddy to do the same. Without stressing or exerting yourself slowly start to fin kick against the down current swimming up the reef slope to shallower water. If you get tired or need a break, take shelter behind a coral bommie. Or in extreme situations hold onto something, (check first it doesn’t have eyes!) so you can catch your breath. If the current does not ease up, it may be best to abort the dive and return to the surface and perhaps choose a different dive site. The important thing with drift diving to avoid these situations is to always dive with an experienced diver who is familiar with the currents in your area. 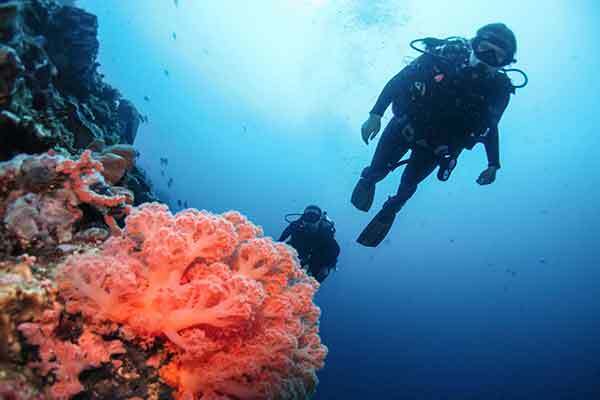 Check conditions before you dive and watch your depth limit always staying close to the reef. If you follow these steps getting into a nasty situation is very easily avoidable. Now don’t let the idea of down current put you off or frighten you… Drift diving is incredibly fun! The name ‘Toyapakeh’ is the Balinese words meaning ‘salt water’ (surprise surprise the water is salty here too). This site is a favourite of almost every instructor on the island. Its beauty is just breathtaking and has been compared by many to Raja Ampat (arguably the best diving in the world). This site hosts some seriously beautiful corals which include bight purple sea fans, green and orange soft corals enormous anemones and just tons of fish. Because the current sweeps past down the channel between the islands, the chance for bigger pelagic fish is quite high. You can see Mola, Tuna, Giant Trevally and even the occasional Whaleshark passing by. Whether you like macro or big fish this is the site for you. The current can range from fast drift to gentle current depending on the tides and its always a pleasure to visit. This site in on the west corner of Penida’s north coast. A spectacular site where the current is always fast so its an awesome thrill to ride what we like to nickname ‘The Penida Express’. 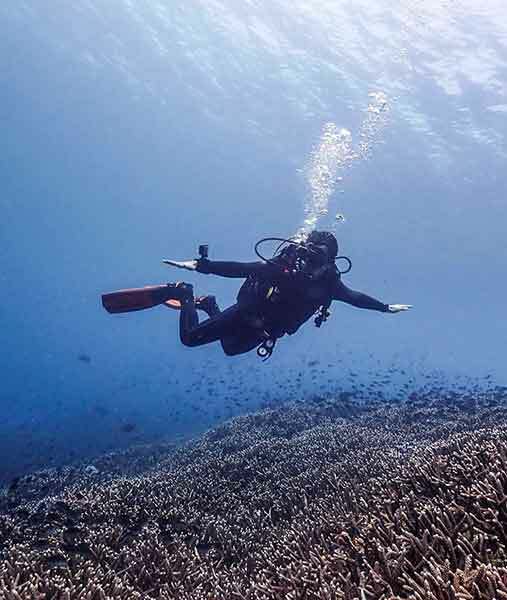 This dive site has too many fish to look at plus some of the healthiest rolling hills of Staghorn corals and giant formations of Porites coral. Bigger animals like Eagle Rays, Dolphins and Mola can sometimes be seen swooping in and out of the current. It’s dive site is always a customer favourite so request this one on your next trip with us! One of the most spectacular dives in Bali is Ceningan Wall, not far from the well loved Toyapakeh. Its one of the most epic dives where you wish you could listen to dramatic classical music underwater. You really feel like you’re diving inside a BBC documentary. The edge of the island drops away beneath your fins to almost complete blackness and a depth 180m plus. The vertical rocky wall its self is studded with colourful soft corals, sea fans and giant barrel sponges. As you drift along the wall staring into the blue you may spot a Mola or reef shark cruising by. On the wall amongst the corals you can find anything from Nudibranchs, lobster, eels and scorpion fish and much more. This site is recommended for experienced divers only (Advanced Open Water with 50+ dives minimum is recommended). It’s never too late to try diving or to push it to the next level. Want to find out more and get the most out of your dives on Nusa Lembongan and Penida with Siren Diving? Ask us about our PADI Drift speciality course and come along for the ride. Turtle tickler and self proclaimed "Slugologist"